Start spreading the news: the Manhattan Bar Stool Cream is now available at Atlantic Shopping. Angular and elegant in its design, the Manhattan Bar Stool is astonishingly eye-catching and utile, making it a functional and fashionable kitchen centrepiece. The deliciously desirable cream faux-leather seat projects all of the sass of the big city at a price that won't break the bank. The modest backrest offers beautifully meticulous stitch detailing and is incredibly supportive. Meanwhile, the chrome stem exudes reflective magnetism along with its protective base to look after your floor. 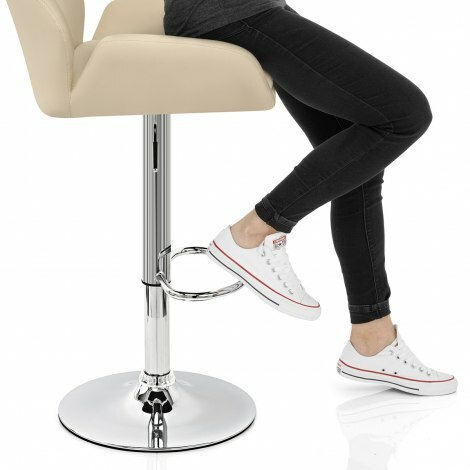 The gas lift mechanism gives users the option of adjusting the height of their stool and a 360-degree swivel is similarly effective, turning the Manhattan Bar Stool Cream into the toast of Times Square. "Look good, very comfortable and value for money"
Fully satisfied in all respects. Excellent service delivery on time very pleased with product. Great ordering experience. Chose, ordered arrived within 48hrs. Well packaged and was informed before hand of time of delivery. Love the stools look fab and are of excellent quality. Very comfy and sturdy. Lovely light cream material with a leather look that in no way looks like cheap 'pleather' just looks and feels like a nice soft leather and is easy clean. Fit in lovely with our new kitchen and extremely pleased with our purchase from start to finish. Easy assemble too. 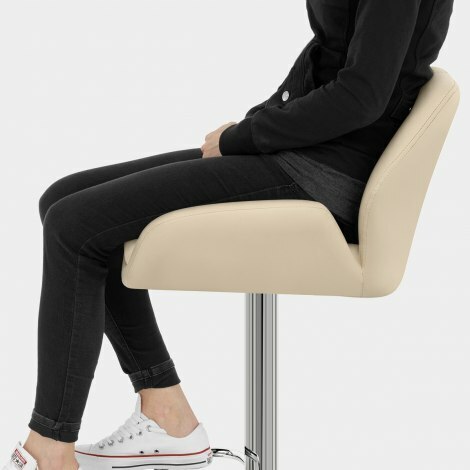 Would recommend to friends and would use again as looking to buy a fith stool for the end of the bar as an 'emergency' chair. We recently had a kitchen refit and needed stools for the island breakfast bar, these fitted the bill perfectly. Stylish, comfortable and look great. Fast and easy delivery.